Tap Color 1 area to cycle dial colors. Tap Color 2 area to open UCOLOR picker. Tap Battery dial to cycle between watch and phone battery indication. Tap Mode 1 area to cycle time modes. Tap Mode 2 area to cycle weather modes. Tap Date area to cycle date formats. In stop watch mode tap "START" to start/stop and tap "RESET" to reset. Tap Center for dim mode menu. Tap Mode text to cycle dim modes Normal, Always On, Auto Always On, Auto Always Plus and Off. Tap OPR to darken LCD panel glow on dim modes 20%. Tap X to close. 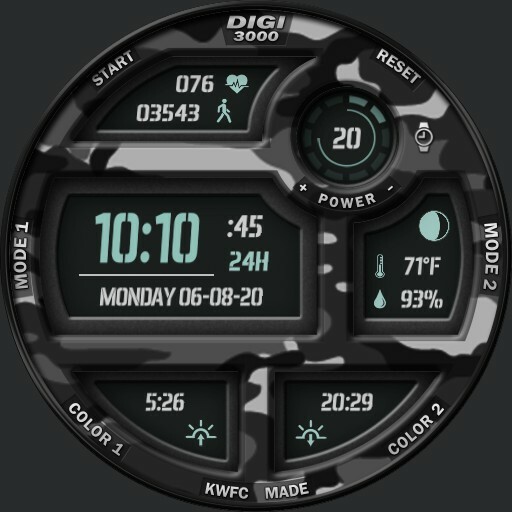 Features UCOLOR for LCD accents coloring and some Text.